With the ancient history of Peru the Incas are indissolutly associated in our minds; but the Incas cannot have ruled for more than about 300 years before Pizarro and his Conquistadores arrived, and some of the most wonderful remains in Peru are indubitably pre-Inca. 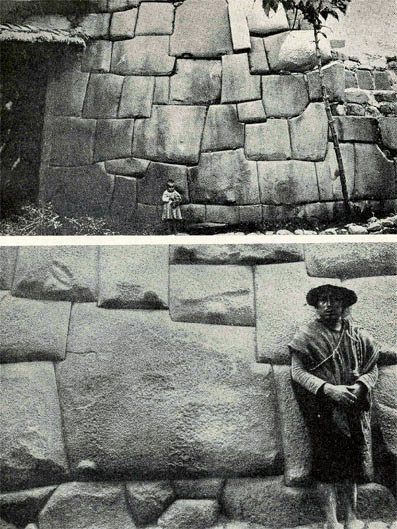 Such is the inimtable polygonal masonry, which still abounds to-day in the streets of Cuzco - whence comes this crowning examples of its class, the famous block of twelve angels and re-entrants, jointed snugly and without mortar to its almost equally amazing neighbours. In the upper photograph is seen another portion of the same well.